Fidelis's constant prayer was that he be kept completely faithful to God and not give in to any lukewarmness or apathy. He was often heard to exclaim, "Woe to me if I should prove myself but a halfhearted soldier in the service of my thorn-crowned Captain." His prayer against apathy, and his concern for the poor and weak make him a saint whose example is valuable today. The modern Church is calling us to follow the example of "the poor man's lawyer" by sharing ourselves and our talents with those less fortunate and by working for justice in the world. If a poor man needed some clothing, Fidelis would often give the man the clothes right off his back. 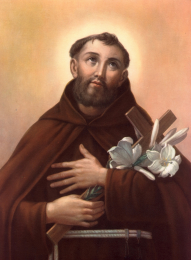 Complete generosity to others characterized this saint's life. Born in 1577, Mark Rey (Fidelis was his religious name) became a lawyer who constantly upheld the causes of the poor and oppressed people. Nicknamed "the poor man's lawyer," Fidelis soon grew disgusted with the corruption and injustice he saw among his colleagues. He left his law career to become a priest, joining his brother George as a member of the Capuchin Order. His wealth was divided between needy seminarians and the poor. He was accused of opposing the peasants' national aspirations for independence from Austria. While he was preaching at Seewis, to which he had gone against the advice of his friends, a gun was fired at him, but he escaped unharmed. A Protestant offered to shelter Fidelis, but he declined, saying his life was in God's hands. On the road back, he was set upon by a group of armed men and killed.